Most Nationally-Broadcast Advertisement campaigns are exquisitely planned, taking months of pre-production involving the best creative minds in the business. They also are blessed with stratospheric budgets. But what happens when your client calls you to produce something, and it's only weeks away? Put down that Ambien, there's no need to fret -- this survival guide can help you rise to the challenge! The University of Notre Dame found out they needed an “institutional message” to air during college football’s BCS title game. This title game was expected to draw over 30 million viewers, becoming the highest-watched sports game in history outside of the Super Bowl. We received a call to see if I could direct the crew and if my company, Explore Media, could produce the entire spot. The caveat? This happened on a Tuesday morning. They needed to shoot by Friday of the same week! If we wouldn't have had the background tips I'm going to share in this guide, I don't think there's any way we would've achieved the results. Working sans an ad agency and directly with the my clients at the University-level, we were fortunate to already have a great concept from their internal marketing team. 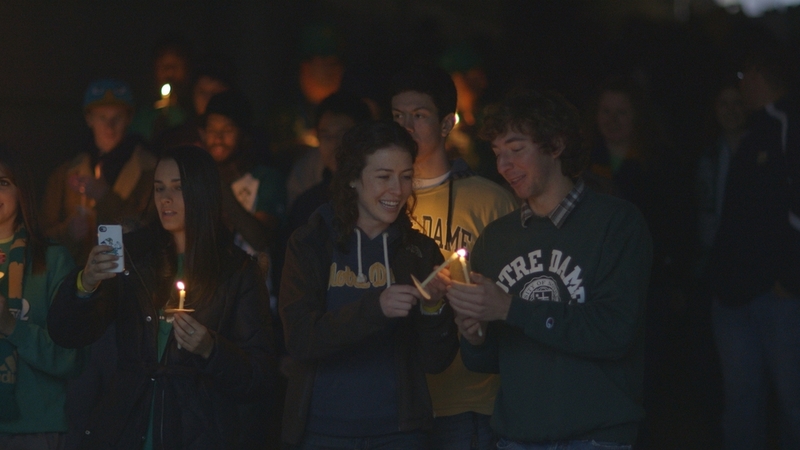 To communicate the idea of Notre Dame being #1 in both athletics and studies, they wanted to show students from all over campus moving towards the football stadium, where they light candles and spell out a human message in the stands. Conceptualizing is great for brainstorming potential ideas, but I find giving myself limits can help maximize creativity and also necessarily narrows the possibilities needed to effectively plan. If you ever find yourself producing a TV ad for the national broadcast, ask yourself "What's realistic? What's attainable?" 2.5 days before the shoot was not the time to add confusion by dreaming up hard to execute scenarios...we debated a few details, chose the most attainable option, then were able to get to move to the next step of planning. The budget for this spot was well below a normal big-brand nationally-broadcast ad budget. Going hand-in-hand with the previous creative tip, on an extremely short time-frame, having a set budget range is necessary to narrow down the number of choices you need to make. Should we hire extras or use actual students as extras? Student extras are only available certain time windows, but the budget doesn't allow for paying 500 extras. Guess which choice we made? Make sure you have clear budget numbers you can track and cross-reference as you start contracting equipment, labor, and the many other line items needed to pull of a big-game television commercial production. Along with the choice of DP, a huge linchpin in this project became finding the right camera system. For the low-light scenarios needed to capture candle-lighting, and especially the ending stadium scene, Daufenbach Camera helped Lichtenheld, Mulholland, and myself arrive on Canon’s C300 camera system. ARRI’s Alexa camera was a legit contender, and Canon's C500 at one time had an advantage, but due to the need for flexible scene setups (ARRI's disadvantage) and the inability of the C500 to capture 4:4:4 convincingly, the C300 became the clear choice. The C300 can capture C-Log at 50 Mbps and is widely considered one of the best low-light cameras in the business. After defining the camera specs on Wednesday of that week, Lawrence Daufenbach went to great extent during an unusually heavy C300 rental week in Chicago to make sure three camera packages with Pix 240 converters were ready to shoot on location by Friday morning. Our challenge was to shoot the University of Notre Dame's iconic campus in a different light; instead of showcasing the usual iconic university images front and center, we wanted to give subtle hints to our location, focusing on the excitement of the students movement. To gain the most creative acquisition during the shoot day, the location scout was an essential variable in finding the right angles, and we were able to avoid some potential problems by checking on logistics, electric, security, and time-of-day sunlight. I took pictures and videos of all scenes using a stand-in (important for checking depth of field and focus), and back at Explore Media we put together a quick mock-up TV spot by combining the pictures/videos with music and rough graphics. If you're a producer or director, chances are you're highly autocratic. The attitude of "I want to do X and I'll do whatever I need to do attain X" works very well in many career ladder-climbing situations, but the top of the ladder can be lonely; and when you lead anything designed to be bigger than yourself, you need to have a team bigger than yourself. For this project, the University staff was amazing in assembling our 500+ talent pool (they had to be real students), procuring locations, mapping out the human-candle message, and providing human support to help wrangle over 500 students and candles the day of the shoot. Our DPs also found us equipment sources (we couldn't drive a grip truck on campus), our ACs prepped extra at the rental house to make sure the camera systems would run seamlessly. Adam Derstine, the director of our 2nd unit, put his creativity into overdrive to find some truly amazing moments. Mark Barry, our 3rd unit camera operator, also helped craft what little lighting we were able to setup for the 2nd unit. I always enjoy working on projects more when everyone can share the vision and develop a sense of ownership. To do this, you need to inspire the assembled team. I found sending and talking through the rough mock-up TV ad from the location scout photos really helped our industry pros, from DPs to PAs, to get a further sense of the totality of our mission...and they also became emotionally invested along the way. Luckily, we've produced and directed enough larger-scale projects to have an insurance agent who understands our business and can get us Loss/Payee and Additional Insured certificates turned around pretty quickly. If you're going to put together a national TV spot, make sure your legal and insurance bases are collectively covered by exploring these pipelines BEFORE the last-minute calls come. As in right now. Go! SCHEDULES -- Not likely you'd forget this one, but we gave all producers, directors, line producers, APs, PAs, talent and clients a schedule so we could all be on the same page between 2-3 units and multiple locations. SHOOT SHEETS -- Just as the schedule is important to “above the line” crew, the Shoot Sheet is important for “below the line” crew like equipment trucks, gaffers, grips, makeup artists, caterers, and anyone else who might not have direct contact with the client to know the particulars of the shoot. Phone numbers for all crew, hotel information, addresses & maps, and most of all, a simple schedule with call times and locations. BOARDS & BROLL -- Got all those images you need to get up there in the old noggin'? Save yourself some time communicating your creative visuals with your DP and lighting director...organize your ideas, pictures, drawings, and boards by scene and check them off as you move along. For this shoot, I cut out a picture of each scene I could show the DP and Gaffer right before, and then when the scene was done, that picture went into the folder. PARKING and GREEN ROOM -- Sometimes you get so busy planning a last-minute shoot you can forget to make sure everyone has a place to park, and a home-base to store cases, to charge batteries, and for your data manager to stage hard drives. This shoot was a little more involved because we had to start at one location, then move linearly to the football stadium where the green room and last scenes were being shot. But we couldn't drive any equipment trucks on the closed campus, so we had to get creative with PAs and runners dropping the crew off then staging our vehicles at our final scene location. There was a moment during this commercial where I could've freaked out. The forecast was calling for rain and cold. Sure this story wasn't supposed to be a beauty shoot, but sunlight adds so much depth to a cold, gray Midwestern world...and the morning of the shoot there definitely wasn't any sun. Quite to the contrary, the rain was pouring outside. Candles don't light too well in rain. People don't look very excited with wet heads. But with all the variables involved--the travel, the crew, the 500+ extras, the budget--shooting on the following day wasn't a viable option. Instead of worrying, we just decided to Execute Despite. Despite the rain, despite the cold, despite the lack of sun. Guess what? The results far exceeded our expectations. In fact, they were unbelievable. The rain actually passed over during our setup time, leaving us with great looking, free wetdowns on our sidewalks and pavement. The gray day actually helped make all our scenes seem like they were shot during the same, dusk time of day, adding to the believability of the story. And most of all, our attitudes got a jolt of confidence from getting great looking shots and "executing despite!" After only 2.5 pre-production days, we used the tips in this guide to produce and direct a team of over 20 crew members at 10+ locations, using 3 camera units to shoot over 500 pumped-up student extras with 800 real and VFX candles. "A Message from the Students of Notre Dame"
During the editing process I worked with Michael Dicken of Explore Media to post rough cuts (using Premiere Pro). After client approval and picture was locked, we partnered with veteran Chicago colorist Kelly Armstrong of Color Playground to provide life to the C-Log shots. With shots ranging from indoor college-life shots to gray-afternoon scenes to low-lit candle shots, Armstrong was able to separate and pull consistently beautiful color from a challenging progression of scenes. During the final scene, we knew that an extra VFX touch would be needed to make the candles in the final scene "pop" the way we visualized, and so after color-correction we partnered with producer Anne Siwek and VFX Smoke-artist Tom Dernulc from Chicago-based post-house The Colonie. to composite the scene. As you can see below, Dernulc was able to fix the lack of candle luminaries in the upper left side of the hash tag, while painting extra students and candles to give a more full, brighter appearance. He also composited a background plate of the stadium seats captured earlier in the final take with a foreground plate of the students forming the #1 sign, which allowed Explore Media to produce a final scene where the candles stand out, but you can still recognize students are assembled in the stands of a football stadium. Congratulations, you've read these tips and hopefully when you get a last-minute phone call to produce a nationally-broadcast advertisement, you'll have all the steps necessary to make your television commercial campaign a reel-making success! Jeremy Pinckert is the executive producer of Explore Media, an award-winning TV ad and web video production company. For more of his work you can see his portfolio, read his blog, follow him on Twitter @exploremediaco.